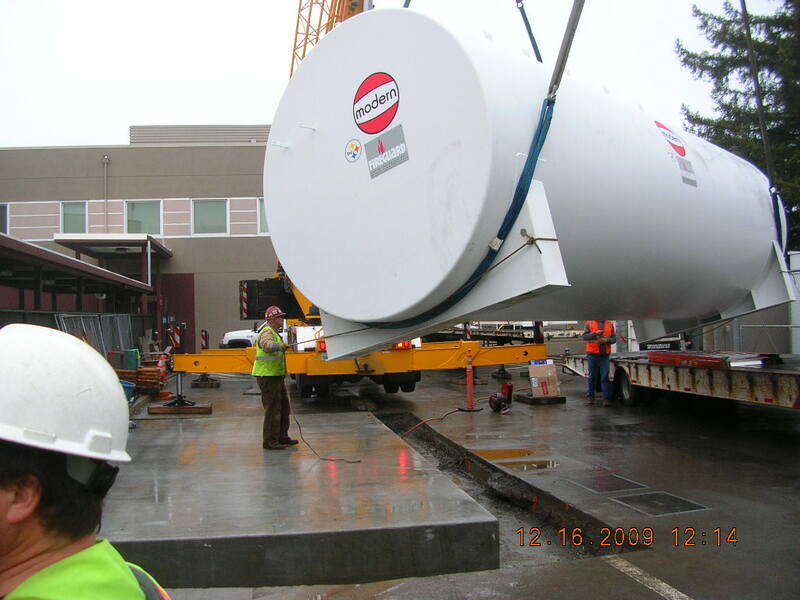 On Wednesday December 16th, a significant milestone in the Kaiser Santa Rosa project was reached when the new emergency fuel tank was landed on its pad. 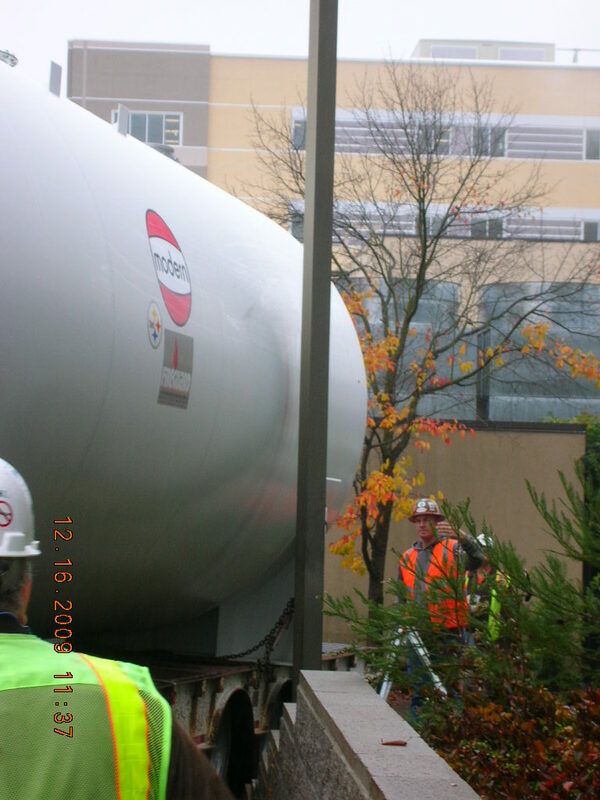 The project, which grew out of a conversation with the Hospital in January 2009, involves adding a new 15,000 gallon above-ground fuel tank with provision for an additional 15,000 gallon tank in the future in the yard at the hospital. 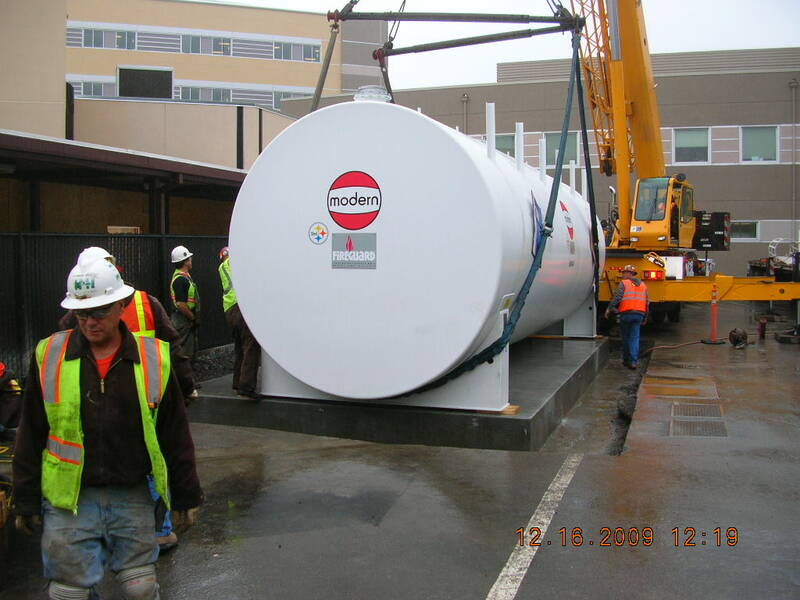 Currently, the hospital is served by a 10,000 gallon underground tank that is 22 years old and reaching the end of its service life. 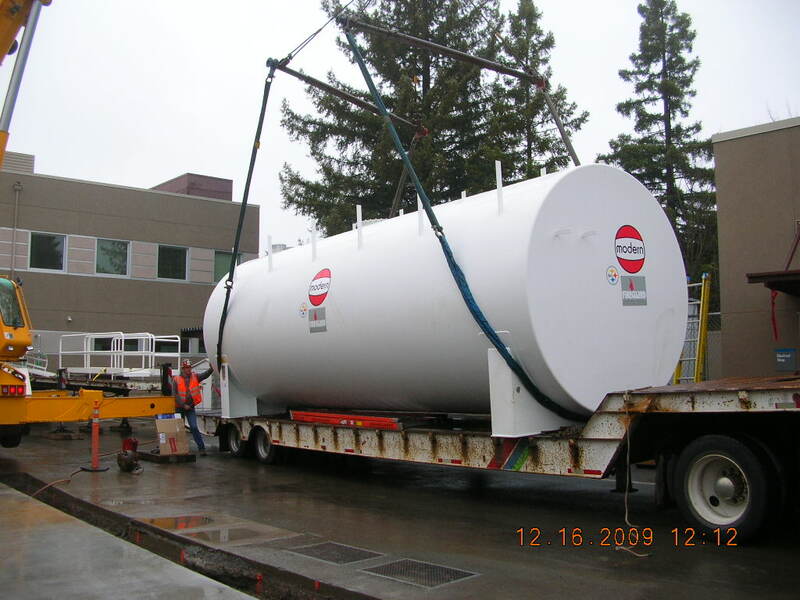 The new tank and fuel system will allow the hospital to decommission their existing underground tank at a future date while keeping emergency systems available without interruption. Trailer and tank blocking traffic on Mendocino Ave. Backing the tank down the fire lane, there wasn’t much room for error. Here, he avoids a light standard by ¾ inch. It should be noted that the driver kept his elbow out the window for the entire time he was backing this massive tank down a very narrow fire lane. The tank leaves the trailer. Two men spin the 45,000 pound tank with two lines. 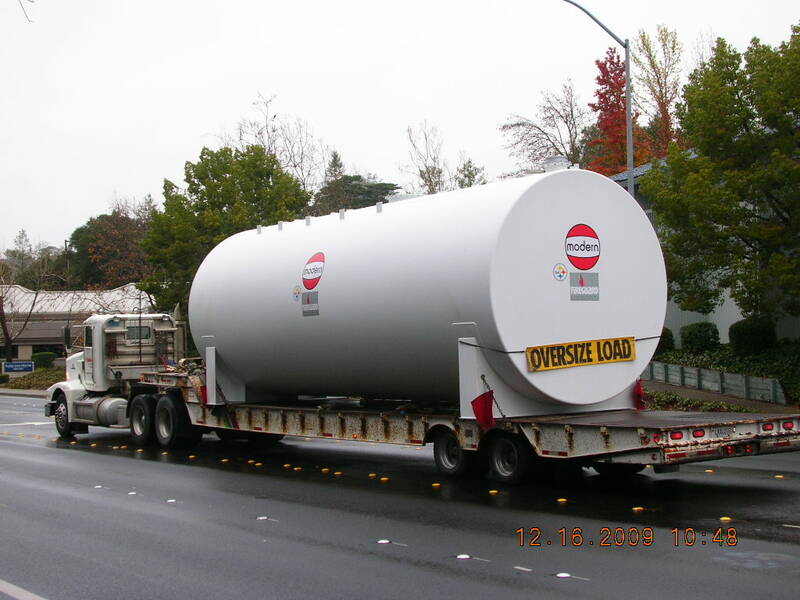 Of course, the tank was oriented backwards on the trailer, so it had to be rotated 180 degrees. While this isn’t the most photogenic project we’ve done for the Hospital, when completed our work will significantly improve the hospital’s ability to serve our community. 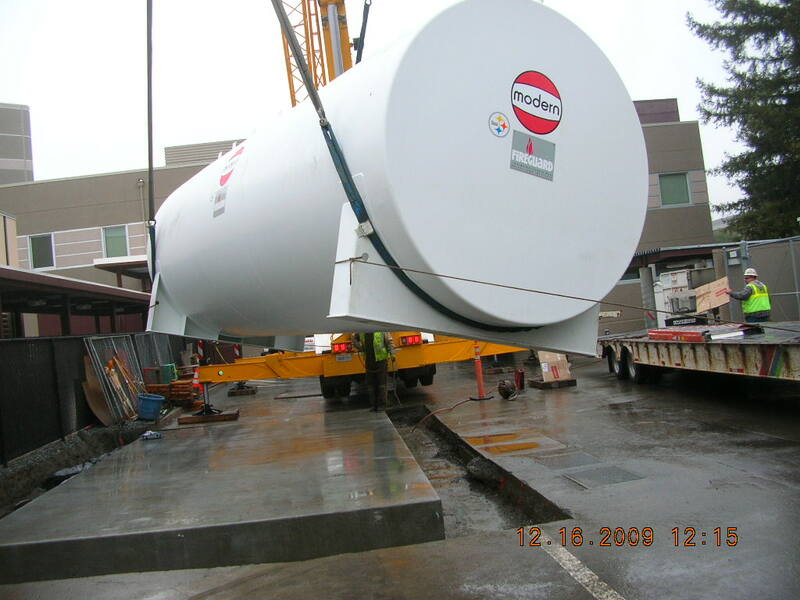 We got authorization from the Owner in May and were able to permit the project through OSHPD and have the tank onsite 7 months later, which is testimony to the good work of Chris Baumbach and Simon Hsieh and the working relationships we’ve developed with HMH, Peterson Mechanical and OSHPD.